Did you know that pediatric dental disease is the most common, chronic disease among children in the U.S.? More common even than asthma or diabetes? More than 40 percent of children experience tooth decay by the time they reach kindergarten, and the decay rate for children with special needs is even higher. Because tooth decay affects millions of children, it is easy to believe cavities are inevitable and just a normal part of childhood. After all, most of us have had at least one cavity throughout our lives. However, poor oral health can have devastating long-term consequences for children. In addition to affecting a child&apos;s ability to speak and eat a healthy, balanced diet, severe tooth decay can lead to life-threatening infections, emergency surgery and even the loss of a young life. So, while teeth may not always get the attention they deserve, caring for them is vitally important for a child&apos;s overall health and well-being, now and into adulthood. America&apos;s ToothFairy: National Children&apos;s Oral Health Foundation was founded in 2006 to address the children&apos;s dental health crisis in the U.S. As a resource provider, America&apos;s ToothFairy increases access to oral health care by supporting non-profit clinics and community partners delivering education, prevention and treatment services for underserved children. While there are many non-profit dental clinics providing free or lowcost care for children in need throughout the As a resource provider, America&apos;s ToothFairy: National Children&apos;s Oral Health Foundation (NCOHF) increases access to oral health care by supporting non-profit clinics and community partners delivering education, prevention and treatment services for underserved children. Visit AmericasToothFairy.org country, they often lack the necessary funding, dental products, equipment, and educational materials to meet the demand for services. America&apos;s ToothFairy established the Dental Clinic Resource Program to increase the ability of clinics to serve more children by providing financial grants, educational materials, donated dental products and equipment. Dental corporations have generously supported this program with millions of dollars of donated products and equipment. Thanks to their support for this network of clinics, more than 896,000 children received free or low-cost oral health services last year. The America&apos;s ToothFairy Smile Drive, a nationwide campaign to increase awareness of oral health and collect oral care products for children in need, engages hundreds of community volunteers each year. Since 2014, more than 1.3 million oral care products, including toothbrushes, toothpaste, floss, rinse, mouth guards and other items, have been collected and distributed through this annual effort. Permeating all America&apos;s ToothFairy programming is an emphasis on expanding delivery of preventive education. America&apos;s ToothFairy assists an array of youth-serving organizations to integrate an oral health emphasis into their ongoing programming. This assistance includes free educational materials, oral care products, training and technical assistance. 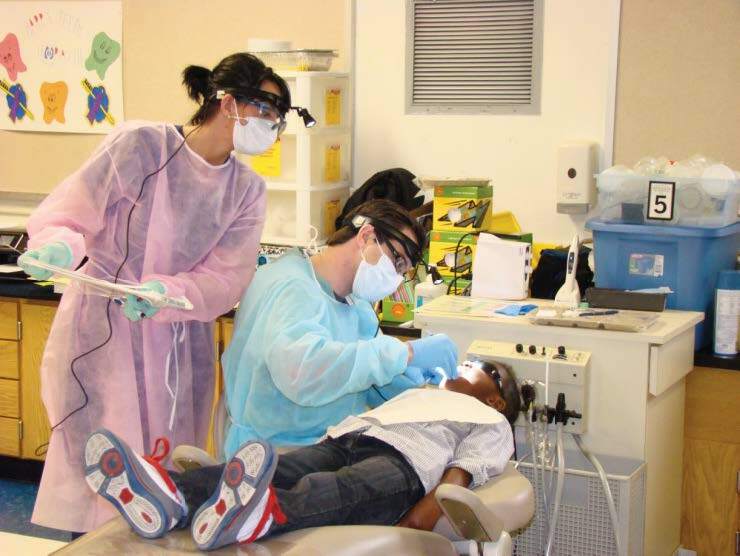 By collaborating with Boys and Girls Clubs of America, HOSA: Future Health Professionals, Special Olympics, National Association of School Nurses and other organizations, large populations of underserved children are receiving oral health education. Distribution of free educational resources and other tools for community outreach allows individual volunteers, no matter their dental knowledge, to promote the important message of prevention in their communities. To date, America&apos;s ToothFairy has distributed more than $17 million in resources to support improved oral health outcomes for children. While significant strides have been made to address the children&apos;s oral health crisis, one in five U.S. children have untreated tooth decay. Children with chronic dental pain often have difficulty eating, talking, sleeping and concentrating in school. Dental problems are a leading cause of school absenteeism, and children with poor oral health are three times more likely to miss school due to dental issues. Untreated tooth decay can cause severe pain, anxiety, poor overall health, low selfesteem, poor social development and low academic achievement. Though childhood tooth decay is largely preventable, many factors contribute to its pervasiveness. First, the separation between dentistry and general medicine has demoted oral disease to a level of importance below many other medical conditions. Most parents make their child&apos;s doctor appointments a priority yet do not know their child should visit a dentist by age one. Second, while mandatory in some states, most schools do not require oral health education. An assumption that "everyone knows what to do" to take care of their teeth is incorrect, and there remains a signifi cant lack of awareness of the importance of oral health, its relationship to other medical conditions and its connection to overall health. Third, due to lack of financial resources, insufficient dental insurance or inability to find a nearby dental provider, preventive dental visits are often skipped or delayed. Once a child&apos;s tooth decay becomes too rampant and painful to be ignored, there is no other choice but to access emergency care. For children with intellectual and developmental disabilities, the challenges can be even more significant. Oral conditions such as tooth grinding, gum disease and tooth anomalies are common among children with special needs and require proper treat ment to correct and monitor. Limited motor skills, language limitations and sensory issues can make basic home care like brushing and flossing difficult. Restricted diets and medications can exacerbate existing oral health challenges. Locating a nearby dental provider willing to treat children with special needs is perhaps the most significant obstacle to overcome. Many dental offices do not have the specialized training or accessibility modifications required to treat children with intellectual or developmental disabilities. For children who do have access to a dentist, a dental visit can be intimidating. Being enclosed in a small room with large, loud equipment and unfamiliar people wearing masks and gloves can be a scary experience for many children (and some adults!). For that reason alone, dental appointments are often delayed. Sadly, it is no surprise that dental care is the most common unmet health care need for children with special needs. ALL SMILES: A child undergoes a treatment at a Dental Clinic Resource Program member clinic; America&apos;s ToothFairy&apos;s efforts increase the ability of clinics to serve more children by providing financial grants, educational materials, donated dental products and equipment. "A number of non-profit clinics and university programs students in effective, compassionate techniques for treating children with special needs." America&apos;s ToothFairy supports programs that increase access to care for children with special needs. Raising awareness of clinics with special needs capabilities, expanding school-based screening programs to include special education programs and donating equipment to better serve children with special needs are just a few of the ways America&apos;s ToothFairy is working to address the gap in care. For example, in Minnesota, America&apos;s ToothFairy supports a dental program that has provided care and education to underserved children across the state for nearly 100 years. Recognizing that the communities they serve have too few dentists and difficulty accessing transportation, they provide dental services in several school districts. Children receive oral health education, screenings and preventive services on the school&apos;s campus during school hours, eliminating a major barrier to care. A grant from America&apos;s ToothFairy allowed the clinic to expand this program to children with special needs. Now, these children who had not been served in the past, are receiving regular checkups, services and referrals for more extensive care. 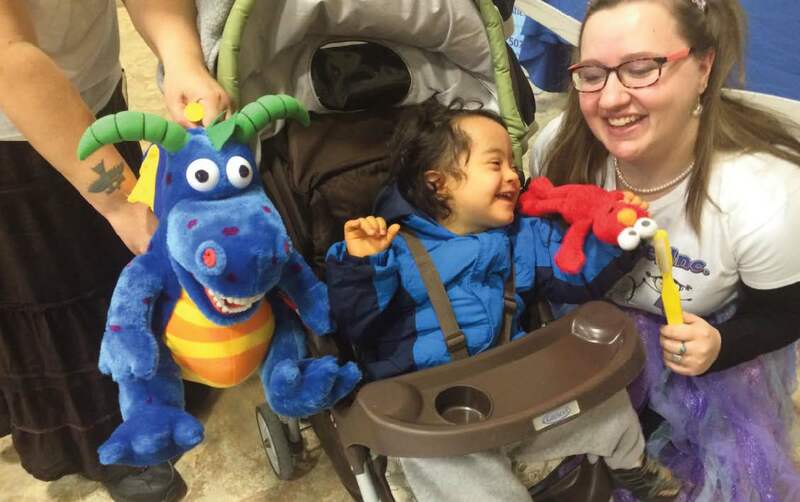 OPEN WIDE: Author Jill Malmgren volunteers at Special Olympics Minnesota; America&apos;s ToothFairy supports Special Olympics with educational materials, oral care products and other resources for their "pop-up" clinics held throughout several states. With support from America&apos;s ToothFairy, the dental school of a Boston University developed a program that provides dental education and oral care products to children on the autism spectrum. This innovative program utilizes America&apos;s ToothFairy educational materials and art programming to introduce oral health concepts. Grant funds also provided the students electric toothbrushes, helping improve their motivation and ability to brush their teeth at home. In Arkansas, America&apos;s ToothFairy supports Special Olympics with educational materials, oral care products and other resources for their "pop-up" clinics held throughout the state. These clinics provide vital dental screenings and dental care for the athletes. 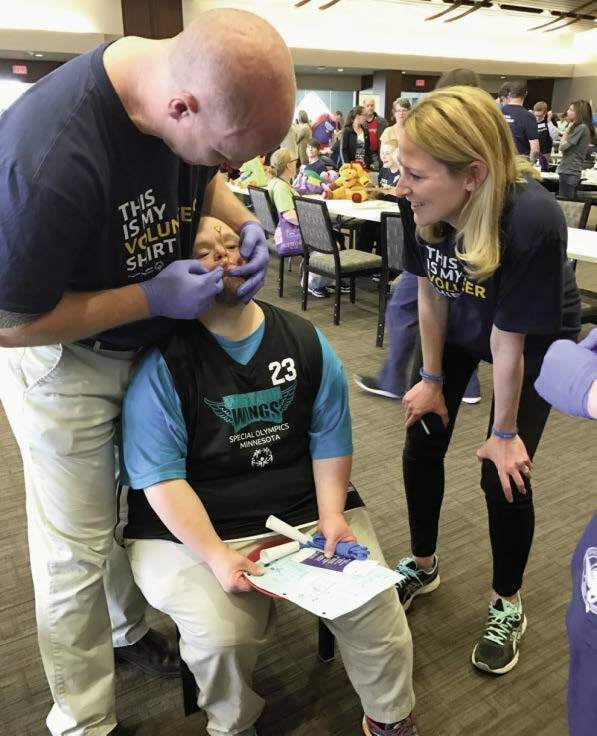 During the summer months, America&apos;s ToothFairy oral health educators will provide adapted education for athletes and caregivers at Arkansas Special Olympics Sports Camps. By supporting these programs and others, America&apos;s ToothFairy aims to reduce dental health disparities for children with intellectual and developmental disabilities. The good news is that a number of non-profit clinics and university programs are beginning to train their staff and students in effective, compassionate techniques for treating children with special needs. Their efforts are making a life-changing difference for parents whose children have struggled through dental appointments in the past. One mother was brought to tears when she witnessed a group of California dental students caring for her 12-year-old son with autism. The students collaborate with America&apos;s ToothFairy to deliver oral health education and preventive services for children with special needs in their community. At first, the woman&apos;s son was reluctant to sit in the dental chair and began rocking and showing signs of irritability and uncertainty. The students calmly reassured him, covering him with a fur blanket and giving him a ball of play dough to mold in his hand throughout his visit. "This was the first time he was able to sit for a dental appointment without sedation," his mom said, amazed at the difference their simple techniques had made. "I can&apos;t thank you enough!" ABOUT THE AUTHOR: Jill Malmgren is the Executive Director of America&apos;s ToothFairy: National Children&apos;s Oral Health Foundation (NCOHF).